'Chinese pressure on Taiwan is unlikely to ease till Beijing feels that stability is being restored in the Sino-US relationship,' says former RA&W officer Jayadeva Ranade. Taiwan has come into focus at this juncture when US foreign policy in the Trump administration is yet to become clear and there is uncertainty about the future trend of Sino-US relations. US President-elect Donald Trump's unprecedented telephone conversation with President Tsai Ing-wen -- which broke with 40 years of ambiguity retained by successive US administrations -- and his subsequent tweets virtually questioning the 'one China policy' have particularly introduced additional tension in Sino-US relations. The earlier anticipation in Beijing of doing a deal with Trump has given way to nervousness. Against this backdrop China's attention will definitely be focussed on President Tsai's 4-nation tour (January 7 to 13) to Central America and her two transit stopovers in the US. Her predecessors have undertaken similar tours, usually soon after assuming office, but on this occasion the circumstances surrounding the visit are different. As soon as Taiwan released the itinerary of Tsai's tour to Central America, Beijing predictably protested to Washington and urged the US administration not to allow Tsai and her 90-member delegation to stop over in Houston and San Francisco -- on January 7 and 13 respectively -- as that could damage Sino-US relations. Unconfirmed reports suggest that some members of the US Congress could meet the 90-member Taiwan delegation accompanying the Taiwanese president and that the US President-elect might take advantage of his not yet having been sworn in to office to meet Tsai. The developments have provoked Beijing to publicly threaten that it might favour a reunification with Taiwan which may not be peaceful. In an article in December 2016 explaining China's view of the international environment and reflective of the hardline foreign policy followed by Beijing since late 2007, Liu Xuejun and Liu Jun, two academics at China's Institute of International Studies at Yunnan university, mentioned China's relations with Taiwan. They blamed the United States for continuously interfering in cross-Strait relations and observed that Taiwan's independence movement is among China's, and possibly the world's, tensest geopolitical situations. The warning, intended not only for Taipei but equally for the US, was a follow-up to the other tough measures initiated by Beijing to pressure Taiwan since Democratic Progressive Party leader Tsai's victory in Taiwan's presidential elections. Also, on December 25, the State-owned Global Times objected to US President Obama signing the 'Fiscal Year 2017 National Defence Authorisation Act,' which for the first time authorises higher-level exchanges between US civilian officials above the level of US sssistant secretary of defence and active duty US military officers and their Taiwan counterparts. Saying such a step undermines confidence and reiterating China's determination to effect reunification with Taiwan, the Global Times called for military pressure on Taiwan. It described the severance of diplomatic ties by Sao Tome and Principe with Taiwan as the first step to discipline 'Taiwan independence', adding that now perhaps military action is required to 'shock and awe' these forces. The articles echo the thinking publicised in an article in the Beijing-owned Wen Wei Bo in September 2013 and entitled 'The Six wars that China must fight in 50 Years.' The article listed a war with Taiwan as the first and claimed it was planned for between 2020 and 2025! 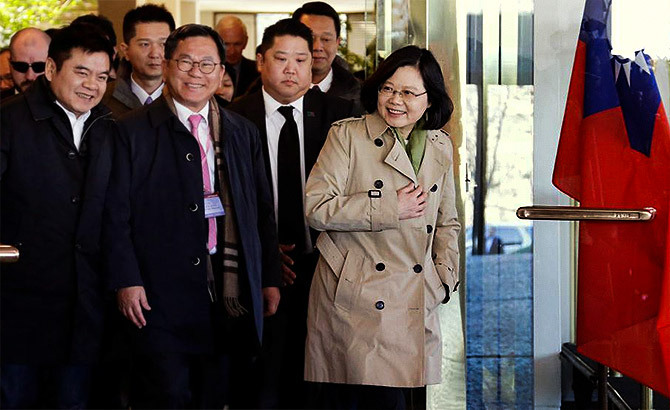 It is likely China could try to mar Tsai's visit to Taiwan's four allies in Central America -- the Honduras, Nicaragua, Guatemala and El Salvador, including by luring other countries into snapping ties with Taipei. Javier Hou acknowledged that officials were on alert with regard to 'an unspecified ally.' Saying that a former director of the American Institute in Taiwan, Douglas Paal, had raised the possibility, the newspaper said reports have for long indicated that the Honduras could switch ties to China. Observing that uncertainty is most in Nicaragua's relationship with Taiwan, it disclosed that though Tsai is scheduled to attend the inauguration ceremony on January 10 of Nicaraguan President Daniel Ortega as he commences a third term, Taiwanese diplomats in Managua were 'having difficulty' contacting Nicaraguan officials to organise details. It noted that no meeting with Ortega was indicated in the official agenda released on January 4, and the only firm arrangements on the schedule are for visits to Taiwanese factories. Chinese pressure on Taiwan is unlikely to ease till Beijing feels that stability is being restored in the Sino-US relationship. Maintaining such pressure also helps China flex military muscle in the South China Sea to further its claims. Meanwhile, in the midst of this uncertainty, Tsai Ing-wen can be expected to continue to calibrate her actions. What did Modi and Xi's 9th meeting achieve?